The teachers said that the hasty convening of the meeting exposes the ulterior motives of the administration, one of which is to exclude the members from expressing dissent. After high-voltage protests by the Jawaharlal Nehru University Teachers’ Association (JNUTA) as well as by the students, the 149th Academic Council meeting was hurriedly convened today. The teachers said that the hasty convening of the meeting exposes the ulterior motives of the administration, one of which is to exclude the members from expressing dissent. The JNUTA members had initially asked for rescheduling of the Academic Council meeting to a later date. Many members went on to state that they did not receive notices for this meeting. 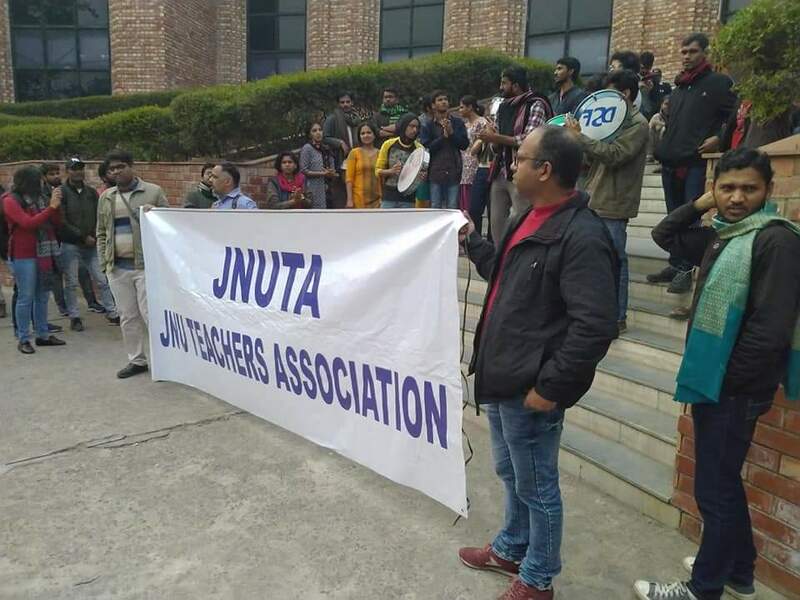 JNUTA had also issued a statement demanding rescheduling of the 149th AC meeting, which had been scheduled for February 12, 2019. The notification for this meeting was received by members of the AC on February 5, 2019 via letter dated February 4, 2019. Stating that the convention is in violation of the clause 3(1) of Regulation M-1, which states that ‘A written notice of every meeting shall be circulated by the Registrar to the members of the Academic Council at least 21 days before the meeting’ and “Items for the agenda shall be circulated to the members of the Council at least 10 days in advance of the date of the meeting.” The teachers led the protest. More than 20 members of the Academic Council had already written to the registrar demanding the meeting to be rescheduled. The demands were made on the following ground. The meeting of the Academic Council is being called only to discuss the adoption of a policy of reservations for economically weaker sections, for which, the JNU administration has not provided adequate papers. Agenda papers do not share any information about the sources for providing additional funds for the expansion of infrastructure and faculty and staff strength in case a 25 per cent expansion in admissions is implemented. Unlike what was the case when 27 per cent reservations for OBCs were introduced, the policy of reservation in admissions for EWS flows not from an Act of Parliament but from an Office Memorandum (OM) issued by the MHRD and dutifully forwarded by the UGC. Without full legal appreciation of whether and how the reservation and a 25% increase in seats across the board is to be implemented and how this will interact with the CEI Act of 2006, placing the matter for discussion in the Academic Council is indeed inappropriate and does not help a comprehensive discussion on the matter. Urgency cannot be cited as a pretext for short circuiting democratic deliberations on this matter and not discuss in detail how best this new policy may be harmonised with the JNU Act and existing admission policy. JNUTA mentioned that this is not the first time, after Professor M. Jagadesh Kumar took over as Vice Chancellor, that such blatant procedural violations are happening in the conduct of a meeting of a statutory body. There have been continued attempts by the Vice Chancellor to disenfranchise the statutory members by prohibiting Dean, SAA and representatives of elected bodies to attend meetings and stacking the quorum of the meeting.